I’m really enjoying getting back into crocheting at the moment. I often struggle to find the time with a full time job and blogging on the side. 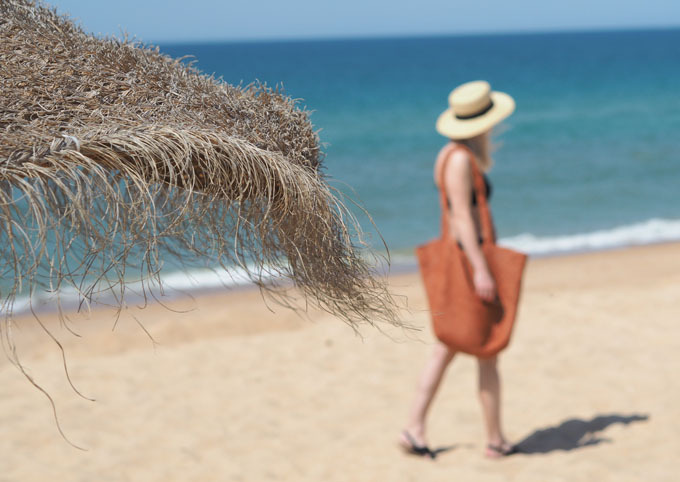 But this month I took advantage of heading away to Portugal for a family holiday to make this on trend crocheted raffia beach bag. 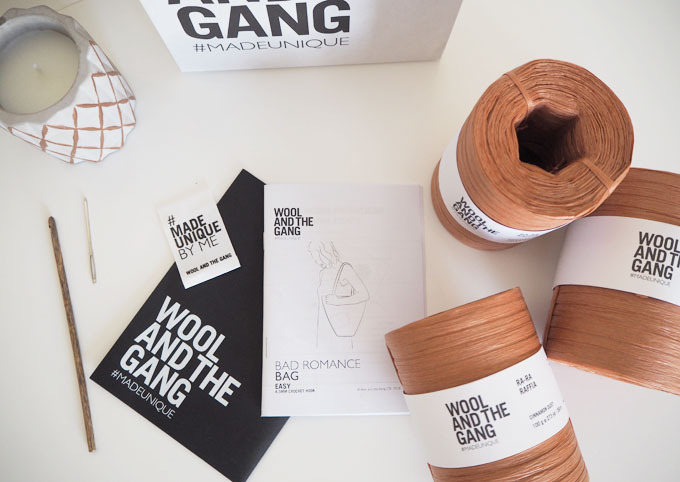 If you didn’t know already, Wool and the Gang are an amazing London company selling knitted, crocheted and macrame kits, yarns and handmade items. They make creating cool, and all their kits and yarns are unique and interesting, which is why I love them. You might have seen I have blogged about attending a Wool and the Gang workshop before, if not read it here. Wool and the Gang have recently launched a new collection of yarn, Ra-Ra-Raffia, just in time for summer, and I couldn’t wait to try it out. This yarn caught my eye as it is made from 100% wood fibres with a light crepe texture, and I had never used anything like this yarn before. All the colours are beautifully natural, not to mention it’s bio degradable and vegan! 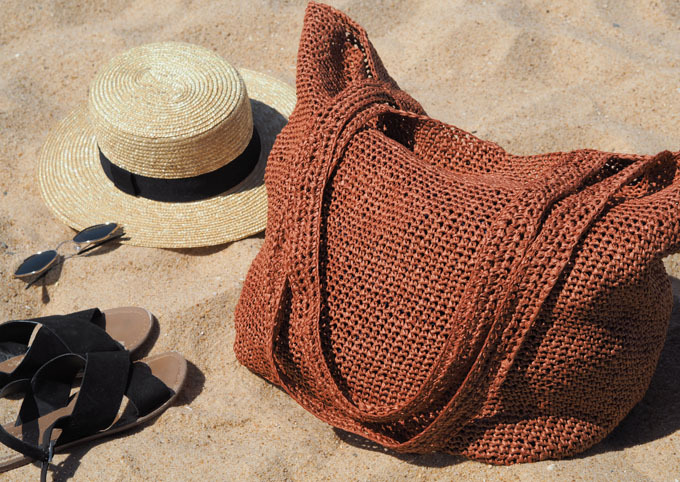 There are plenty of kits to try out using the yarn, I chose the oversized Bad Romance bag as I thought it would be the perfect beach bag on holiday. I started making the base of my crocheted raffia beach bag, by chaining 35 stitches using the 4.5mm hook. I then worked each row in double crochet (single in US terms, the pattern uses US terms but I‘ll use UK for this post) following the pattern until I had my base. 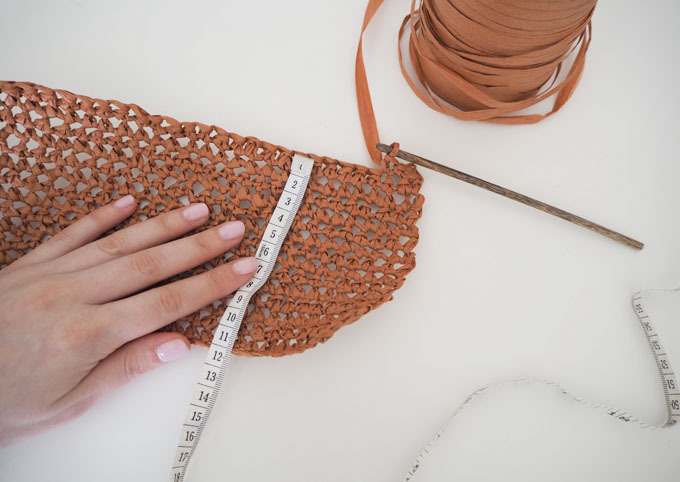 The bag features a really pretty line detail around the base created using double crochet stitch through the back of the stitch. This was my first time trying a stitch like this, and although only a slight change in technique it creates a really lovely feature separating the bottom of the bag and the sides. Once the base was complete, I followed the pattern working in a continuous round to create the sides. 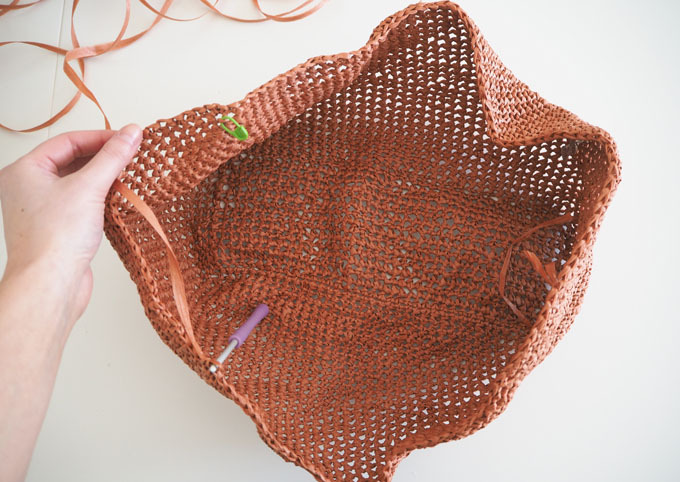 The pattern used increase stitches at the corners on every few rows to create a bucket shape to the bag. I used stitch makers, which are little coloured hooks attached to my work, these really helped to keep track of where my corners were. As I worked towards the top the increase rows became more frequent to create an oversized look. Next I worked on the handles which used the same stitch for 4 rows along a 105 stitch foundation chain. I made two of these before sewing the whole thing together and tying in any loose ends with the sewing up needle. The pattern is ‘easy’ which is a step up from beginner, which I would agree with. 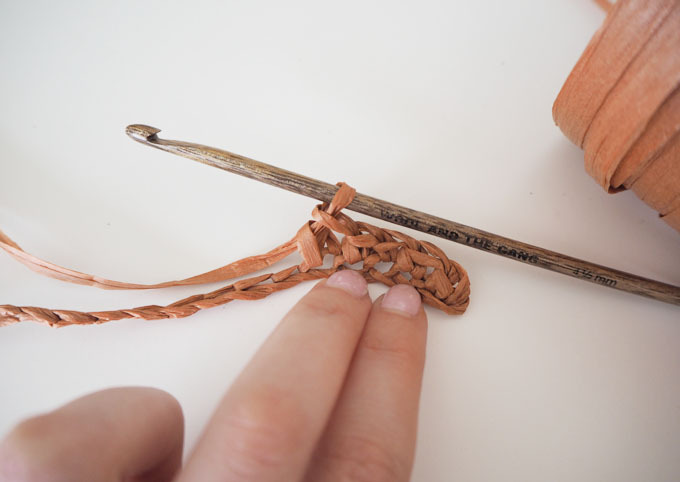 Although it sticks to one stitch, some terms might seem a little tricky for beginners. For example the increasing parts as these can be difficult to keep track of if you aren’t familiar with crocheting. The good thing about Wool and the Gang kits is there are plenty of levels and projects to choose from. You can pick one depending on your ability. I would say this kit is great for a learning/intermediate crocheter wanting a fun and rewarding project to help improve their technique. I like how the pattern is explained in simple step by step terms rather than traditional crochet ‘code’. This is great for learning crocheters to understand the pattern if they are unfamiliar with crochet language. 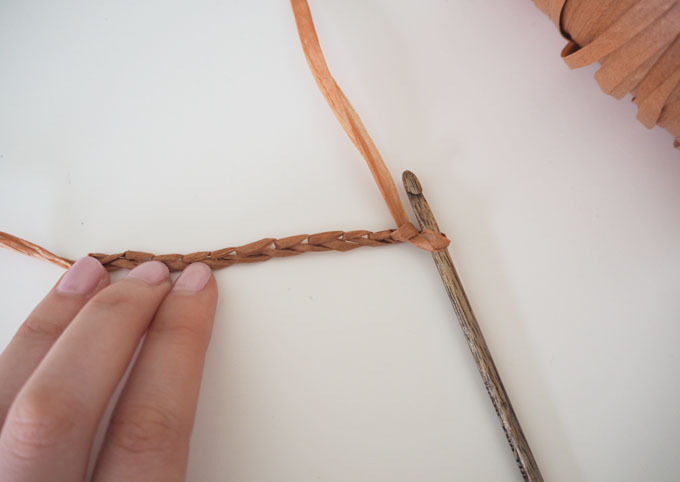 The booklet included in the pack not only has the pattern in, but also has the techniques explained and measurements draw out clearly, which is really helpful. The only thing that threw me was the use of US terms (double crochet in UK is single in US). But this was quickly resolved by watching a video on Wool and the Gang’s You Tube channel which explained the single crochet technique. My bag was a little bigger than the estimated measurements in the pattern. This could be due to my tension being too loose or just the way I crochet. Overall my bag measured 67cm wide at the top x 44cm high. This could also be the reason I ran out of yarn a few cm short of the top of my bag. I noticed I had limited yarn left so started making the handles before I had finished the bag. Going back to the bag once I had two handles made. I’m glad I did this as I was short of a couple of rows just before I finished the bag. This didn’t bother me however as my bag was plenty big enough and it wasn’t worth buying another ball of yarn for a few rows. I’m really happy with how my crocheted raffia beach bag turned out. As I mentioned, my bag is a little bigger than the pattern plans but I think that’s the fun of it all. You’re making something unique with your hands, no one really knows how it will turn out! I started making the bag a few weeks before I went away, snatching a few hours here and there after work. I finished it on holiday whilst lounging by the pool. 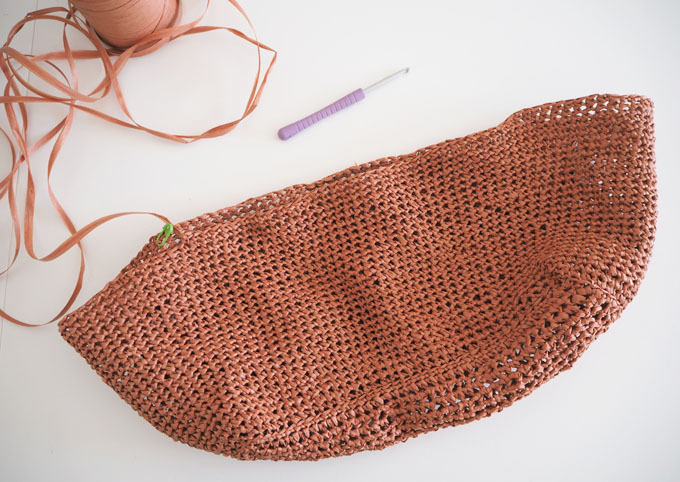 This bag is great if you are heading away and want a longer crochet project to get stuck into. The kit I chose used 3 balls of yarn but if you want a shorter project, look for one with with one or two balls. I’m itching to start another crochet project now, maybe I could make something for my home over the summer! I hope this post was useful if you are thinking of buying a Wool and the Gang kit, or trying out the new Ra-Ra-Raffia yarn! Feel free to drop me a message below or on Twitter or Instagram if you have any questions about Wool and the Gang! I’d love to hear if you have tried any kits before and which ones you would recommend! I was kindly gifted the kit in this post to review and try. All my opinions are my own and I am very proud to work with such an amazing brand. I can’t believe this is handmade. I love DIY stuff and I also love basket bags, so your blog really opened my eyes to just create one too. Thank you for the awesome idea!